Base Hologram Logo A circle with a shadow under it and the text next to it "Base Hologram". 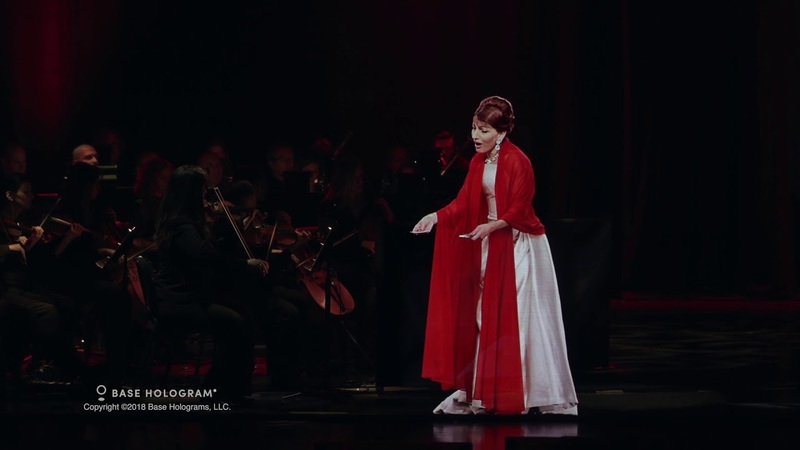 Callas in Concert is a triumphant event that brings the beloved opera legend Maria Callas back to the stage via hologram, singing to the accompaniment of a full live orchestra. As this unprecedented performance unfolds, you will surrender all notions of what is real and get lost in the magic of the iconic La Divina. From the moment the curtain rises, you are enthralled in Callas’ world. Her most iconic performances of Bellini, Bizet, Verdi, Puccini and more feature original recordings digitally remastered and re-created on stage through breathtaking state-of-the-art digital and laser technology. Yet this is far from a replay of her past glories. You will delight as Ms. Callas playfully engages the conductor and you will stare awe-stricken as she reacts to you, the live audience. On this fantastical evening you will experience the legendary emotional force that is Maria Callas. From one moment to the next you will feel her passionate heat, cool detachment, heartrending vulnerability, fierce confidence, and breathtaking grace. You will bear witness as she inhabits her operatic characters, and evokes the drama that inspired her sobriquet, La Divina. This is a celebration not to be missed.